[Episcopal News Service – San Salvador, El Salvador] Families with small children, single mothers and their babies, young men and women, adolescents, the elderly, they all gathered here on a late October morning at the Plaza Salvador del Mundo to form a caravan and begin the long walk north through El Salvador, across Guatemala and Mexico, and for some, eventually to the U.S. border. It was the second of three caravans to depart that day from the plaza, where a statue features Jesus Christ, savior of the world, standing atop planet Earth. Some 250 people – many carrying just backpacks and bottled water, some lugging large suitcases that would prove hard to maneuver within blocks of the trek – left in the second caravan; others would join them along the way for the 2,600-plus-mile journey. 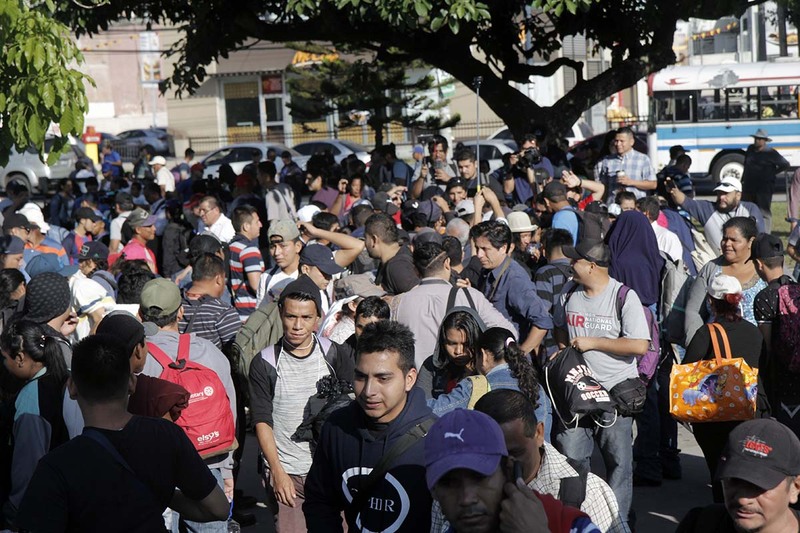 The caravans leaving El Salvador followed one that departed Honduras earlier in the month. 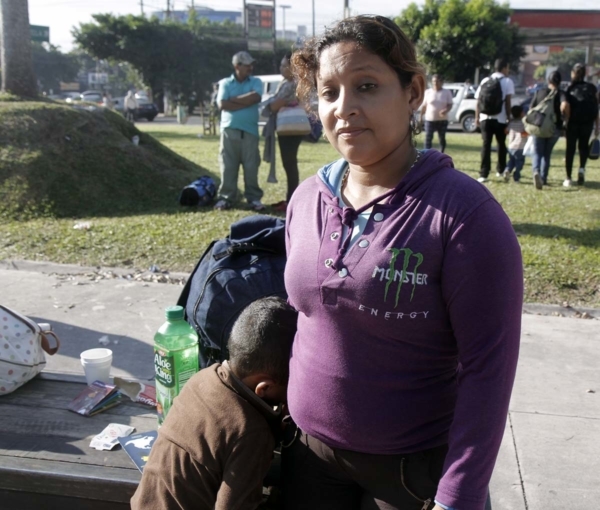 Carla, 29, and her 4-year-old son, Anderson Roberto, were among the second Salvadoran caravan to leave that day. Carla volunteered her last name, but in interest of safety it’s withheld. A mother of three, she left her 8- and 2-year-old daughters behind with her father; it would be too difficult to travel with three children, she said. She wants to give her son a better life, and to get a job to provide for her family. It was a decision Carla said she has contemplated for five years. As she spoke, Anderson Roberto cried and held tight to her leg. Across Central America’s Northern Triangle, a region that includes El Salvador, Guatemala and Honduras, more than 700,000 people have been forcibly displaced by violence. Forced displacement – whether or not it is recognized – has become a political issue regionally and in the United States, where President Donald Trump has called economic migrants and asylum seekers an “assault on our country,” and his administration has deployed 8,000 troops to the border. The president has vowed to deny asylum claims of migrants who attempt to enter the United States illegally, meaning not through a designated point-of-entry. Hundreds of Central American migrants arrived in Tijuana, Mexico, on Nov. 14, and more followed on Nov. 15, as city officials scrambled to offer shelter in what could be an extended stay. The Episcopal Diocese of the Rio Grande is sponsoring a Border Ministries Summit in El Paso, Texas, Nov. 16-18. Episcopal News Service will provide coverage. Such was the case with Jose Antonio, 34, who two years ago lost his job at a supermarket where he’d worked for 15 years. Jose Antonio, who declined to give his last name, was with his wife, Daisy, 34, and their two children, Maria, 11, who wore a “Frozen” cap – Disney merchandise from the popular film – and Uriel, 4, who wore a “Cars” cap. Migrants have been traveling in caravans since the 1990s; the one that left Honduras in early October is one of the biggest in history. The current caravans’ size and visibility break with the paradigm of clandestine border crossings sometimes aided by human smugglers. Cristosal began in 2000 as a partnership between Episcopal clergy in the United States and El Salvador. It later became an independent nongovernmental organization with a $2 million budget that has grown from three employees in 2010 to more than 60 in three countries thanks to a U.S. International Aid and Development grant, though it still maintains close ties to the Episcopal Church. Episcopalians donate $350,000 to the organization’s annual budget. Of the three Northern Triangle countries, only Honduras has recognized the existence of forced displacement, establishing a national commission to study and document cases. That’s about to change, however. In July, as a result of Cristosal’s work, El Salvador’s Supreme Court gave the government six months to officially recognize forced displacement by violence in the country, design special legislation and policies for the protection and assistance of victims, and make victims of displacement a priority in the national budget. 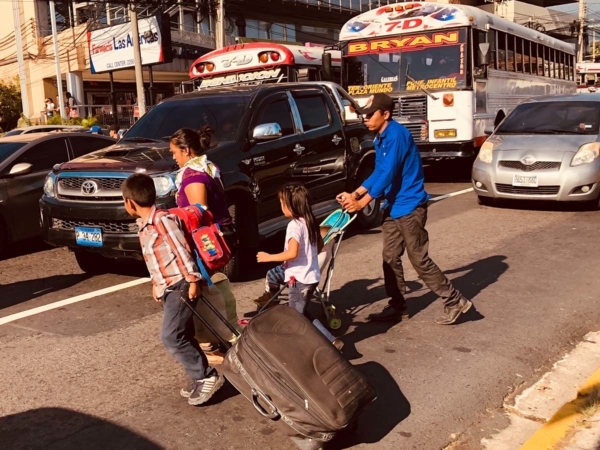 Ferris, a research professor at Georgetown University’s Institute for the Study of International Migration and a former director of the Church World Service Immigration and Refugee Program, was in El Salvador to provide technical expertise to advance the legislation. Forty countries recognize forced displacement, but only 11 or 12 have strategies to address it, said Ferris. As early as 2013, individuals and families began showing up at Cristosal’s office seeking assistance, some of them referred by the U.S. Embassy because at the time the Anglican-Episcopal Church of El Salvador resettled refugees through Cristosal’s office. And then in 2014, 69,000 unaccompanied minors, mothers and children arrived at the U.S. border, bringing attention to the high number of people forcibly displaced by violence in Guatemala, Honduras and El Salvador. The number on the Southwest border dropped to 59,692 in 2016 and to 41,435 in 2017, according to U.S. Customs and Border Protection. By then, Cristosal had two to three years’ practical experience dealing with forced displacement by violence. USAID recognized its work and encouraged Cristosal to expand its presence and develop an adaptive response beyond El Salvador and into Honduras and Guatemala. Still, it was the support of Episcopal churches and individual Episcopalians that allowed Cristosal to become one of the foremost organizations addressing forced displacement in the Northern Triangle. The Obama administration responded to the unaccompanied minor crisis by increasing security at the border, detention and interdiction by Mexico of minors and families seeking refuge in the United States. Trump made curbing immigration a centerpiece of his election campaign. Then, in the first eight months of 2018, Customs and Border Control agents detained more than 252,000 people – 32,371 unaccompanied minors and 59,113 families at the Southwest border – and the administration began separating families. The family separation policy coincided with the first caravan’s arrival when, of the several hundred members who requested protection, 95 percent were found to have a credible fear of persecution and were referred for a full hearing in the immigration courts, according to the U.S. Department of Homeland Security. On Oct. 22, Trump threatened to cut aid to Central America if countries did not act to stop the flow of migrants. In advance of the Nov. 6 midterm elections, Trump used the caravans as a scare tactic, and his political team produced an ad portraying immigrants as a violent threat. U.S. TV and social networks pulled the ad and denounced it as racist. Reductions by Trump’s White House to the nation’s refugee resettlement program show an interest in limiting more than just illegal immigration. The United States was a worldwide leader in refugee resettlement just two years ago, when more than 80,000 refugees were welcomed into the country with help from the nine agencies with federal contracts to do that work, including Episcopal Migration Ministries. That number has dwindled under the Trump administration, which announced Sept. 17 it would reduce resettlement further, to no more than 30,000 a year. “When Salvadoran refugees left in the 1980s, three percent were recognized as refugees, forcing Salvadorans who came to the United States to marginal parts of our cities, where they became gang members and then were deported back to their countries of origin, which gives us the basis of the current violence that is driving people out,” said Bullock. The region has a strategic interest in promoting safety and security in Central America, “because un-stabilized, unprotected people destabilize,” said Bullock. From 1980 to 1992, El Salvador suffered a brutal civil war fought between its U.S.-backed, military led-government and a coalition of guerrilla groups, organized as the Farabundo Martí National Liberation Front, or FMLN. The war was fueled mostly by the gross inequalities that existed between a small group of wealthy elites who controlled the government and the economy and the majority of the population, which lived in extreme poverty. In post-war El Salvador, grassroots human rights and social justice organizations have played a key role in protecting the historical memory and bringing these cases out of the shadows of history. In 2016, Cristosal began using strategic litigation to get justice for victims and end the long-standing culture of impunity and is working on both the El Mozote and the 1982 El Calabozo massacres.